Fraud is a major challenge in our industry and while this feature won't prevent fraud entirely, it certainly provides a pre-emptive measure against it by allowing you to temporarily reserve funds up to 24 hours prior to the start of the trip or at the time of booking. How does Pre-Authorizing Credit Cards work? Simply put, a hold can be placed on a credit card either when a ride is booked or when a card is added. To access pre-authorizations go to "Settings" > "Billing Settings" and you will see the checkbox beside 'Apply a Pre-Authorization'. You simply enter the flat $ amount you would like to see authorized when an individual ride is booked in Dispatch, the Customer Booking Widget, or through the Client Facing App (if you have one). This selection is a bit more dynamic and you'll have to make a few more choices based on whether you require destinations at the time of booking. You have the opportunity to place a hold on up to 100% of the charge when the ride is booked. Note: This % will be based on the quote of the ride if you require a destination. 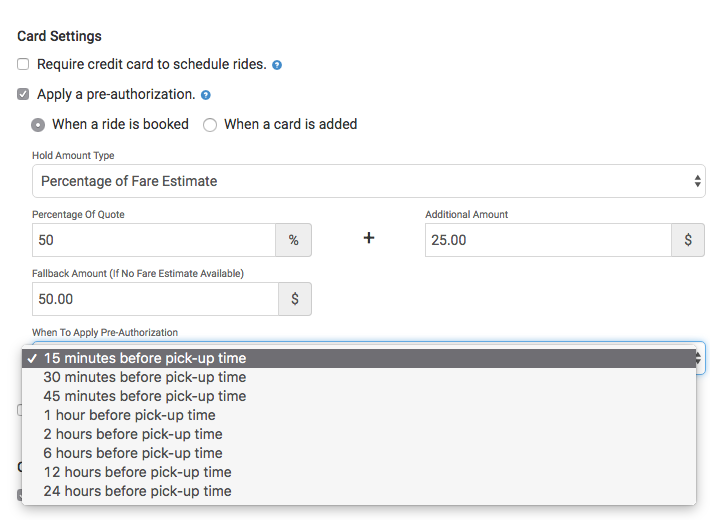 Another available option is to apply an additional $ amount which will be added on top of the % of the Fare Estimate --> percentage + a bonus amount (i.e. 100% of estimate + $20). If you do not require a destination, you will instead have to apply a 'FallBack Amount' (when no fare estimate is available) in order to capture the desired amount. If fare estimate is selected, but no estimate is found, the "fallback" amount acts as a default. You can apply a pre-authorization up to 24 hours before the start of the trip in order to temporarily reserve funds. The system will attempt to capture the funds in the fashion of how you set up your parameters. Either a flat fee or a % of the ride. If a ride is pre-scheduled less than their pre-auth interval, the ride creation will fail. For Example: If I set my pre-authorize 1 hour before my ride, and I have my Service Level pre-schedule set to less than 1hour, it will attempt the pre-auth before the ride is created. As mentioned before, you can also apply the pre-authorization amounts at the time of booking. If the customer does not have the funds, the card will be declined and both Dispatchers and Passengers will know immediately. **If the card fails after booking, an email notification will be sent to the dispatch email address, and a banner will appear at the top of the ride that indicates that the hold failed.